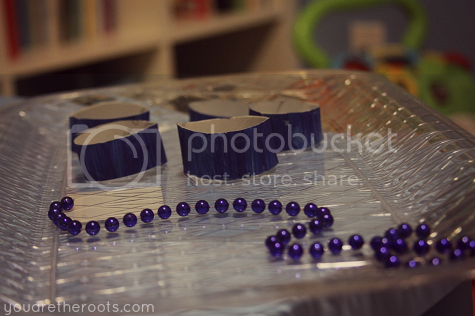 This week was blue week in tot school and, honestly, I'm a little sad to see it go. This was probably both my favorite and Ethan's favorite week of tot school so far, for some reason. I'm not sure if it was the activities (which were all a huge hit, minus the felt board -- typical! 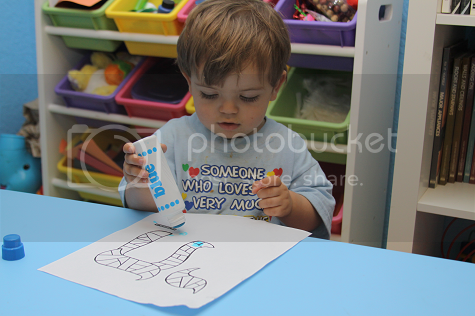 ), the fact that blue is such a fun color or the fact that Ethan was just crazily into tot school this week. I went with blue this week because it was Hanukkah so we fit in a lot of great Hanukkah activities into our regular tot school schedule. Being that Ethan celebrates Hanukkah, it was important for me to include bits and pieces of Hanukkah tradition into our daily life. 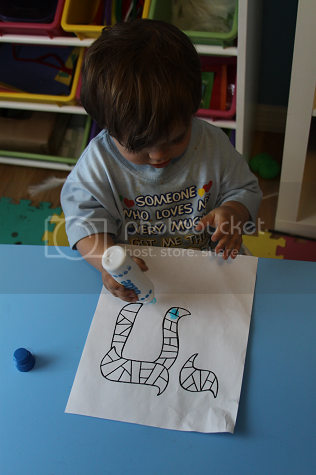 At the end of the week, Ethan was able to identify "boo" (blue) things and it was really cool to see. 1. 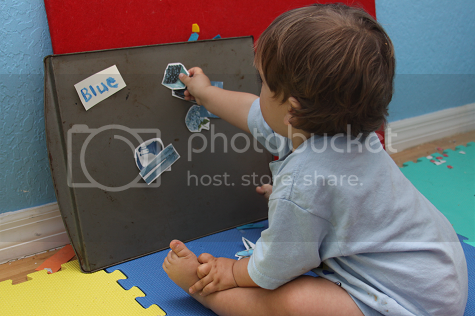 Blue Magnet Board - Ethan loved doing this last week during red week, so I recreated it with blue week. 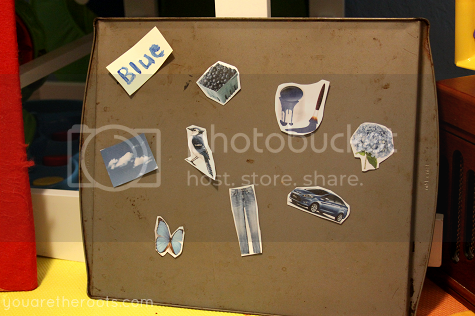 I laminated pictures of some blue items and put magnets on the back so he could stick them up on an old cookie sheet. 2. 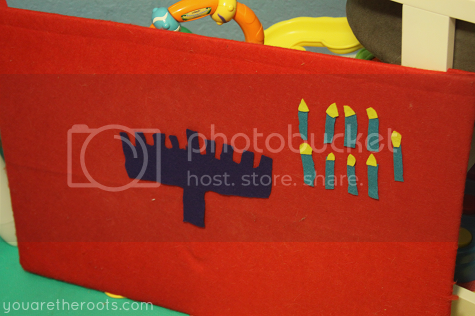 Menorah Felt Board - Ugh, the felt board. I've been trying for months (as in, well over 6 months) to get Ethan to like the felt board. Something about the texture, or something, but he can't stand it. He was remotely interested in this activity for a few minutes but only did it once and that was it. Essentially, the point was to stick the candles up on the menorah. It was fun the first time, but then he was okay to never look at the felt board again. 3. 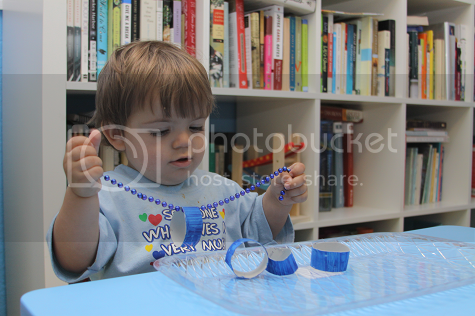 Blue Stringing - I painted an old toilet paper roll blue, sliced it into rings and had Ethan string it onto a strand of blue beads. He liked this activity a lot. I've noticed he likes stringing activities best when they're on beaded strands or colored ribbon rather than "boring" shoelaces or plain colors. He also discovered he can twirl the rings around and around by swinging the strand of ribbon, so that was his desired end result to stringing each time. 4. 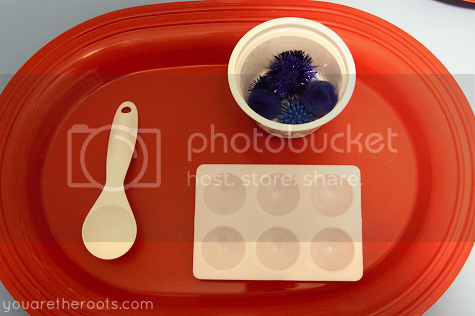 Pom Pom Sorting - I placed blue pom-poms in different sizes in an old Greek yogurt cup and Ethan used a measuring tablespoon to scoop them out and sort them into the different wells of the paint palette. 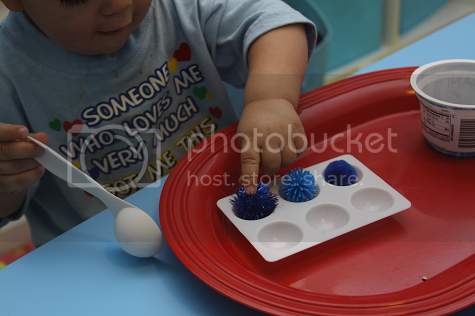 He had a little bit of difficulty with getting the pom-poms out of the yogurt cup with the tablespoon and getting them exactly into the desired well, but he got the hang of it after a while and really enjoyed this activity. 5. 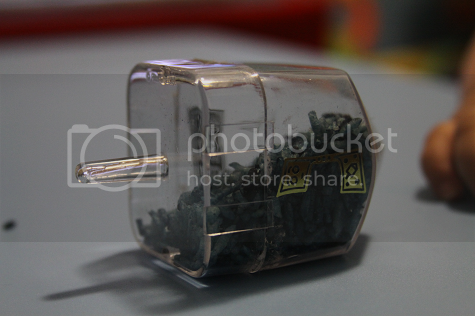 Dreidel Sorting - Another Hanukkah activity! 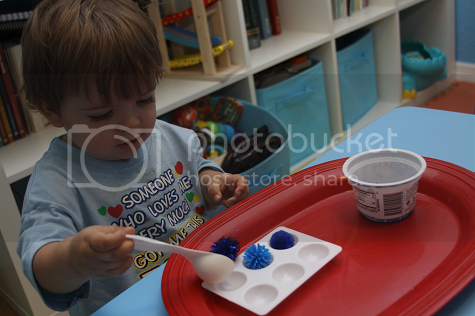 I painted old yogurt cups blue (as best as they'd cover in finger paint!) 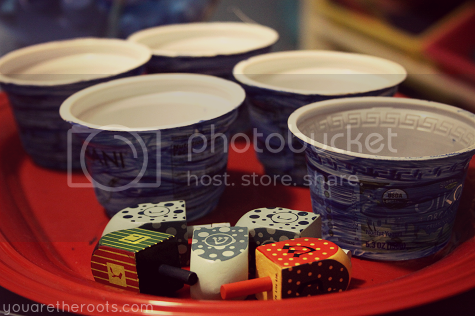 and Ethan got to sort different dreidels in each cup. 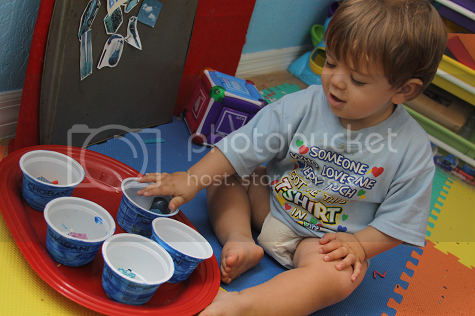 It was really interesting for me to watch Ethan do this because of how he'd arrange the cups. He'd line them up, put them on the ends of the table, put some on the table and some on the floor and just walk around placing the dreidels in each. 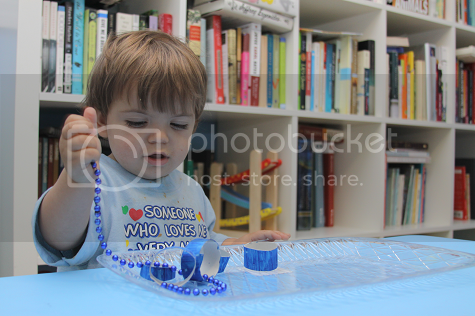 Sometimes he got creative and would try to pour the dreidels from cup to cup. The possibilities were endless! 6. 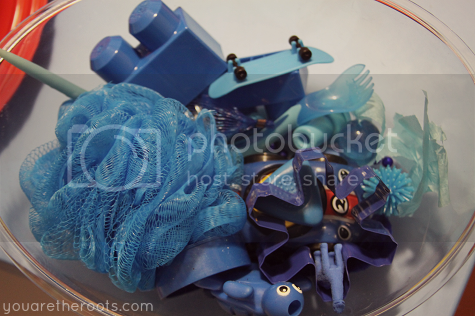 Blue Sensory Bin - The blue sensory bin was a last minute project with things I had around the house. 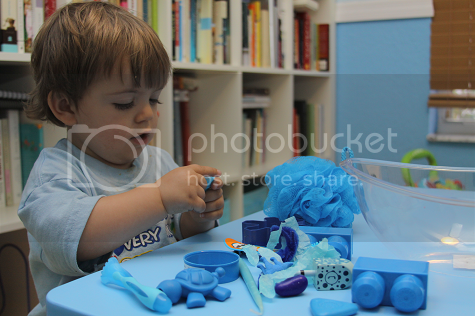 I guess there are lots of blue household items! 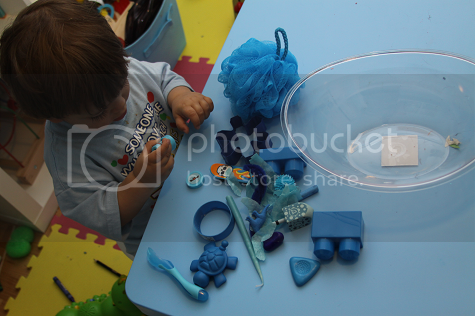 Included was a cookie cutter, bath sponge, bath toys, tissue paper, Hanukkah candles, a blue car and other small toys. 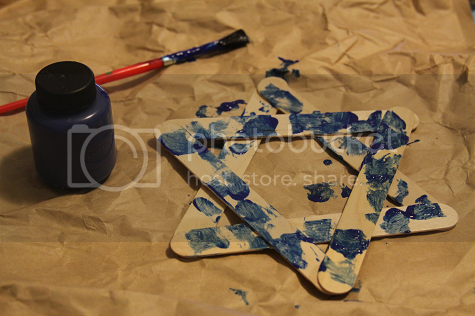 We did a lot of Hanukkah-themed art this week, including dot paint (Ethan's favorite) and painting a popsicle stick Star of David. 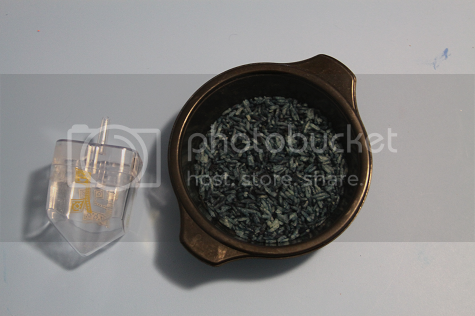 We also did a fun craft using dyed blue rice and a fillable dreidel. 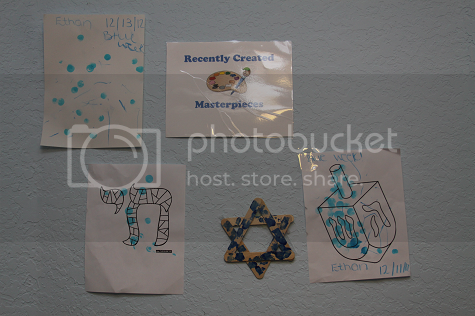 Ethan was able to fill the dreidel with the blue rice and listen to all the cool sounds it made as a shaker or while spinning it.